On Sunday, August 14, a whopping 157 women lined up and took off running. That was the field for the women's marathon at the 2016 Summer Olympics in Rio. And while only 133 of the competitors actually finished — 26 miles and 385 yards is a long way to go — it still brought about a number of exciting and impressive sights and achievements. But now, in the days following the event, a pair of twin sisters are suddenly catching hell. 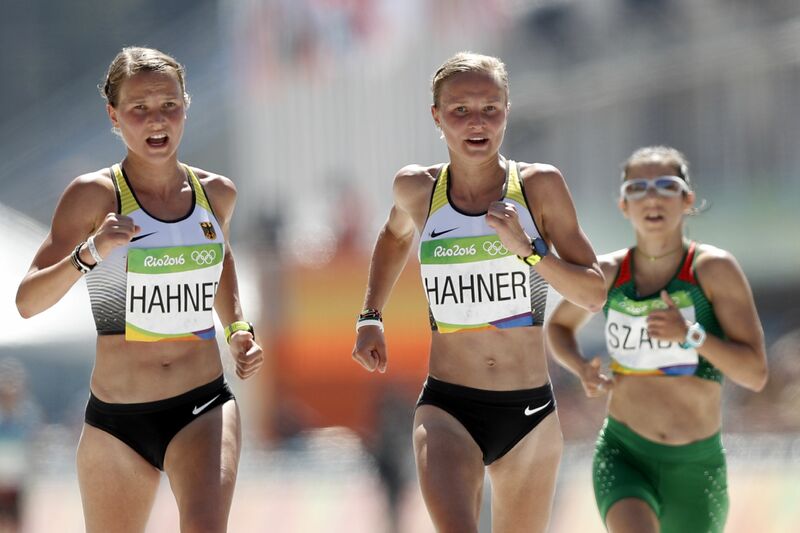 The Hahner twins' hand-holding marathon finish in Rio has touched off a controversy about how hard they actually tried to win. Here's the controversy, if you even even really call it that: The Hahner twins of Germany, Anna and Lisa, finished well below their personal best, and more than 20 minutes behind the race's winner, Jemima Jelagat Sumgong of Kenya. They finished 81st and 82nd out of the 133 who completed the race, and being right alongside one another, they decided to join hands as they crossed the finish line. Of course, when it comes to the world of social media, there are going to be trolls, critics, and bullies — if anything's guaranteed in life, it's that someone out there will try to give themselves some fleeting pleasure by taking a long, slow sip of haterade. But criticism of the Hahner sisters has gone well beyond the social media fever swamps, as Christopher Clarey detailed for The New York Times on Tuesday. In fact, no less than the sports director of the German Athletics Federation has publicly slammed the duo, accusing them of looking like they were participating in a "fun run" rather than an Olympic event. Lisa was always not far from me. After 40 kilometers, there was a turning point, and I knew, ‘Okay Anna, two kilometers to go to close the gap to Lisa.’ I invested all I had and 300 meters before the finish line, I was next to Lisa. It was a magical moment that we could finish this marathon together. We did not think about what we were doing. For the record, regardless of whether the Hahners truly ran as hard and as desperately as they could, there have been plenty of instances in which athletes visibly eased up on the gas pedal. Look at Olympic immortal Usain Bolt's dramatic 100-meter gold medal sprint in the 2008 Beijing Olympics, for example. He dominated the field so thoroughly that he clearly slowed his gallop as he approached the finish line, raising his arms out to the sides in exuberant exultation. Of course, he won the event, so maybe that's the reason people object to what the Hahner twins did. But let's be real: They were never going to win the marathon, not against the competition in that field, so judging them by that standard is utterly unfair. But more to the point, isn't this the kind of soft-focus, emotional family moment that the Olympics are supposed to be all about? Or at the very least, the kind of moment that has been celebrated before? All in all, unless you're truly strident about this, it's hard to see this story as anything but a country's sports authority needlessly stirring up trouble for some of its athletes, and that's a shame. Hopefully, the memory of getting to cross that line together will mean more to the Hahner sisters than any of this criticism does.